A Genevan bridge with the towering fountain in the background. Geneva can do better. Stepping off the train in Geneva, one is met with the forked road conundrum. Turn left and go to Switzerland. Turn right and go to France. I was sorely tempted to go to France, only so I could say I went to France two weekends in a row. That sounds so much more glamorous than if I were living in a Canadian provincial border town in say … Alberta, and I could say “I’m going to Saskatchewan for the day,” and do it just by crossing the road. I’ll bet there are French people in Alberta who right now are thinking about skipping over the border to Saskatchewan and bragging about it later. I’ll bet they have French relatives in France who do not know what a non-event provincial border-jumping can be in Canada. And while I’m rambling, in my reporting days, Saskatchewan was the provincial name that earned the most derision when mentioned in interviews with non-Canadians. They doubted it existed and when confronted with the realities of the geographical gap that its absence would create, they doubted anyone would burden any place with such a long and convoluted moniker. I think it is a cool name just for that reason. But I drift from my topic which is: Is Geneva really all that bad? 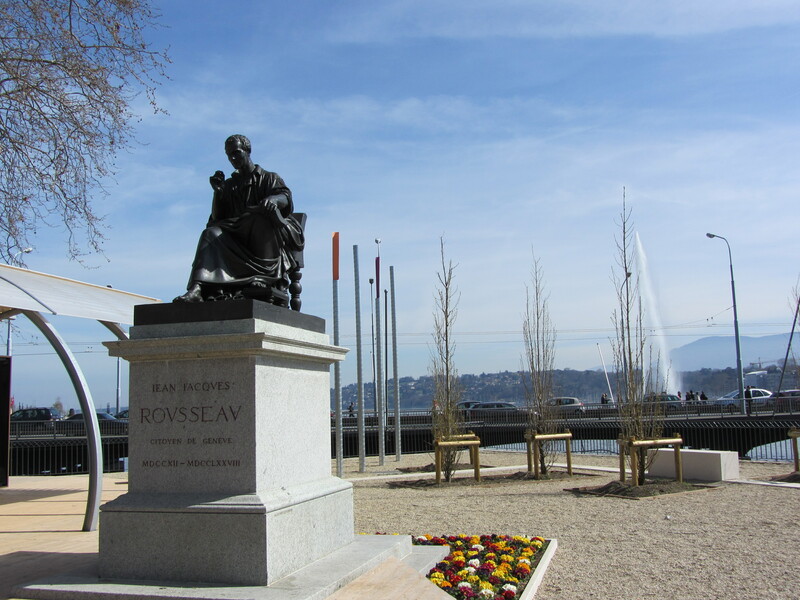 The only bridge adornment we could find in Geneva was an open-air statue and "museum" about the philosopher Jean-Jacques Rousseau (1712-1778) who left Geneva at the age of 16, and who irritated the city leaders to such an extent that they burned his books here, but later capitalized on his fame by erecting a statue. A small detail: Rousseau spent two months at St. Peter's Island in Biel/Bienne and counted it as the happiest time of his life. No it is not. But it does have a few problems, beginning with a snooty waiter who forgot he was in Switzerland where the cultural practice is to extract as much money as possible from tourists by being polite to them. I’ll come back to him later. We rolled through the train station and ran into Geneva’s first tourist foible. The train station is nowhere near the tourist district-proper. 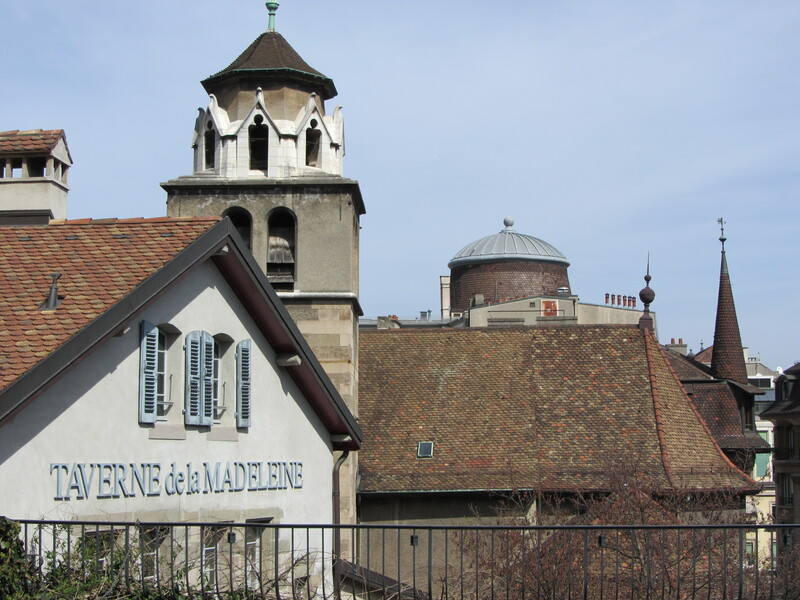 One has to walk through the city’s ordinary downtown, which is not extremely ugly, but it certainly lacks the quaint accordion-player charms of other Swiss locales. When we came upon the River Rhone, it was strapped with bridges that were all function and no fashion. 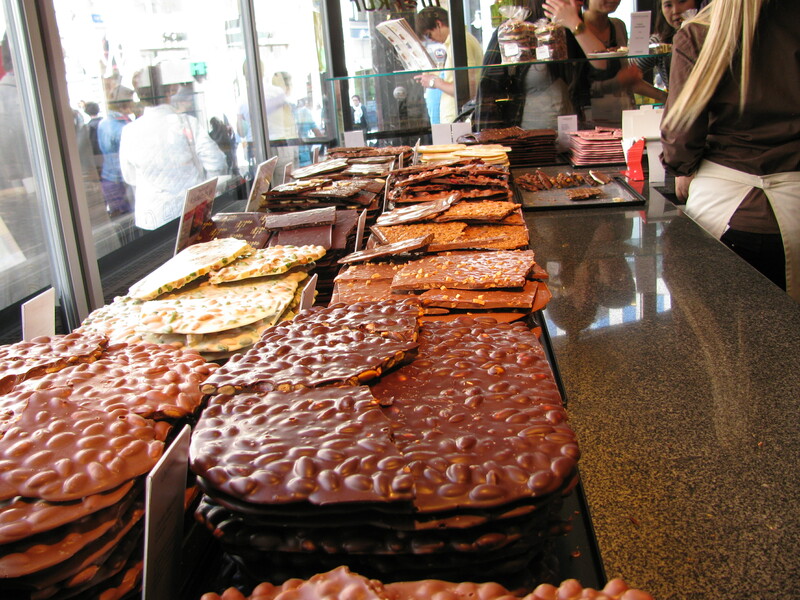 This is a huge drawback for a Swiss tourist spot. Every town seems to have cute bridges here – even Olten, Switzerland’s not-so-great small town, has a lovely covered bridge. We can probably blame Julius Caesar for the lack of charming bridges. After all, he is reported to have blown up or burned a bridge in Geneva, and maybe the city planners were forever-more discouraged from investing in bridges. After all, if a titan is going to roll into town and burn the thing, why even bother? We found our way to the city’s historic district, which is surprisingly small for such a globally renown city, but once inside it, we enjoyed wandering its winding narrow streets and old stone buildings – and yet, there was something missing. We cannot say what. It eludes us. What Dave looks like when he sees steak on the menu for the same price as we would pay for an entire strip of prime beef tenderloin back in Canada. Math on this statement: 1 steak/$70 in Switzerland, or 15 steaks/$70 in Canada. Or maybe it was $60? No matter - it is really high up there as far as our restaurant pricing sensibilities go. 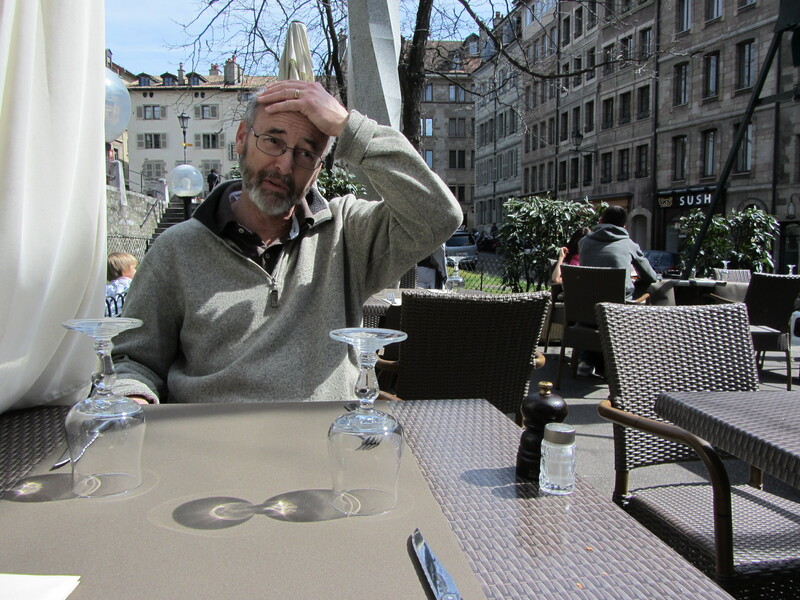 We found our way to a small half-filled open-air cafe’ where we asked to sit at a table that was half-sun/half-shade – perfect for Dave and I whose preferences for sunlight differ. The maitre’d, on hearing our request, raised his shoulders in that classic Frenchman shrug and protested, saying the table arrangement was for four, not for two. We didn’t see a line-up of diners waiting behind us, so we politely persisted, but he instead put us at a table right next to the shade/sun one, also a table for four, that was completely in the sun (he pulled the table arrangement apart so we were then technically at a table for two). We overlooked this mildly peevish behavior until we opened the lunch menu and saw $35 poulet and $70 bouef. If customers are going to fork over that much money for a plate of food, they should be able to sit anywhere they like, even the kitchen, or perhaps while standing on the maitre’d’s toes. We left. 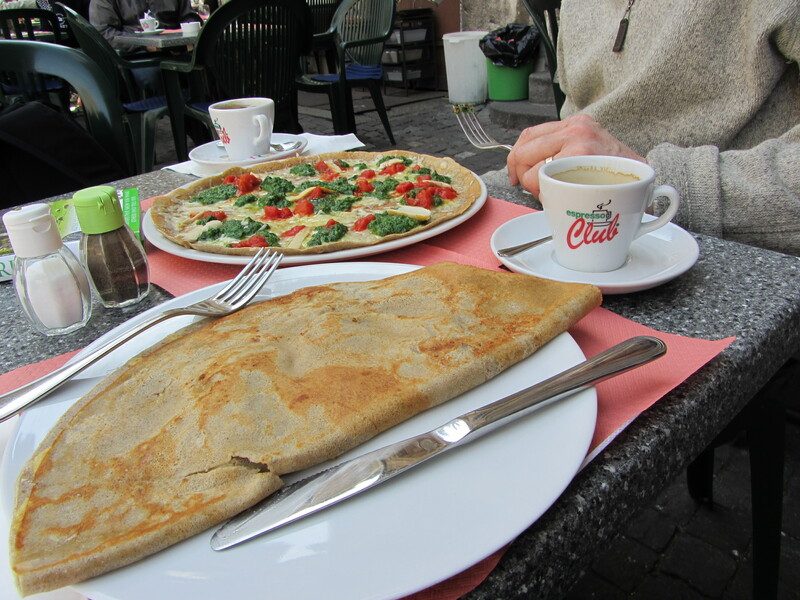 Next to St. Peter’s Cathedral where John Calvin delivered his inspiring sermons during the Protestant Reformation, we found a quaint creperie where we dined on buckwheat crepes filled with cheese, mushrooms, spinach and chicken. They were delicious and the service staff were delightful. the most popular search engine term used that landed readers was “jungle design.” I cannot explain that. the weirdest search engine term that landed readers was “Ringo Starr McDonalds.” I cannot explain that either. 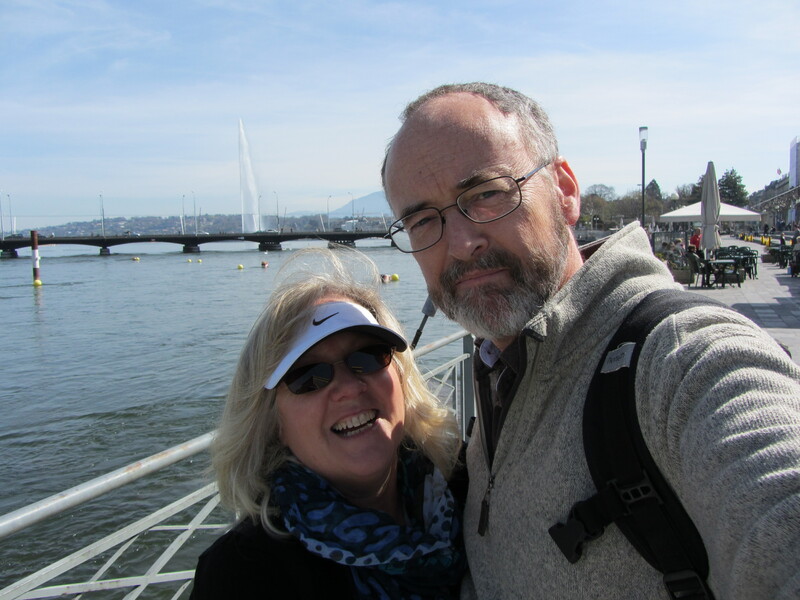 ← 91: Geneva: Get Up + Go, Or Not?